Believed to be the only program of its kind in the world, it enables stricken animals to rediscover calm and trust while at the same time teaching troubled humans who work with them to help heal themselves by going deep within their own consciousness and finding stillness. 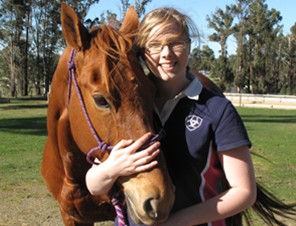 Based in Shepparton, Horses for Hope is a non-profit service under UnitingCare ‘Cutting Edge’, a frontline rural support agency working with the most marginalised and disadvantaged communities. It is having remarkable success with people of all ages for whom traditional therapies have proved inadequate. Some of its most dramatic effect has been on the scarred hearts and minds of people and horses who survived the day of darkness at noon, 7 February, 2009, ‘Black Saturday’ bushfires around Kinglake and Marysville, which decimated 820,000 acres of land, destroyed 1800 houses, and killed 159 people, with a terrible toll of local wildlife and livestock, including horses.